Posted by GayPatriotWest at 4:55 pm - September 1, 2008. I just arrived here in Minnesota and am blogging from the home of Powerline‘s John Hinderaker, my host for the weekend and will soon head into St. Paul to pick up my blogger credentials at the Xcel Center. 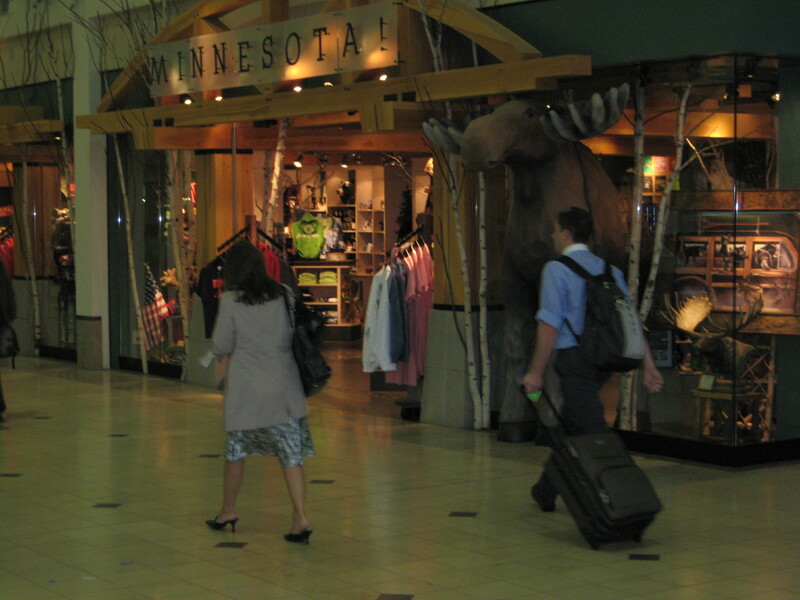 As I arrived at the airport, I took delight in seeing a wooden moose an airport gift shop It remind our Vice-Presidential nominee of her favorite dish. Posted by GayPatriotWest at 8:00 am - September 1, 2008. Back when I started law school, just after I came to terms with my feelings for men, I imagined I would find my beshert (destined or beloved). After I graduated we would move in together. I would practice law for a few years, just to get enough experience to make contacts and prepare myself for a writing career. He and I would live openly as a couple, but not call ourselves gay. We would go to social functions together. We wouldn’t advertise our homosexuality; we would just live it. Our lives, however, do not always go as planned. I didn’t meet my beshert in law school. Law firms who interviewed me got the sense I wasn’t serious about the practice of law. I found myself in our nation’s capital writing a novel and back in the political arena. Soon, I became active in Log Cabin as much because it was a place to meet other like-minded gay men as it was because I respected the leadership of the Capital Area club. The then-president of that club pressed me to set up a Northern Virginia chapter which I did when I decided to leave my job on Capitol Hill. Not long thereafter, I found myself writing screenplays, some with gay themes. In order to better market them, I moved out here, hoping to pursue a career in the entertainment industry. But, as I began my graduate studies (in mythology, a field would expose me to stories and themes which would improve my screenwriting skills), I wrote the this blogger who called himself GayPatriot, praising him on a post he had written. He invited me to join this blog. I was writing about politics again — and enjoying it. I say all this as preface to my trip tomorrow to St. Paul for the GOP convention. In my ideal world, imagined when I definitively came out of the closet as a gay man, I might go to such a gathering, taking my beshert. I wouldn’t be going to cover it as a gay man, but as a writer. Now, given the nature of this blog, I’ll be covering it as a gay man, to offer a unique perspective on the confab. I find that in some ways a delicious irony, given my feelings about identity politics. Is it fate that makes fools of us all?